How to Roast a Turkey! One thing I have discovered lately, is that with a lot of families who desire to make their own food, the chain of learning has been broken. Meaning families are no longer passing down information about cooking, leaving us to stumble around and learn how to do routine things on our own. So in the spirit of passing on traditions, and it almost being Thanksgiving for a lot of you, here you have the way I cook up a turkey for the holidays! I’ll start with stuffing first, I get my kids to rip up an entire loaf of bread (which of course you can change-up depending on how much you want). This is their favorite part of stuffing. I have them put it in a giant bowl. Once they are done I add water and poultry seasoning and mix together, I keep adding both with tablespoons until all the bread is covered mostly evenly with the seasoning and most of the bread is moist. I mix in an entire onion (diced) after the seasoning has been spread around. Set that aside and move onto the turkey. I rinse mine all off, and make sure you remove the giblets (usually in a little bag) and the neck, it’s pretty gross and most of the time my kids will make sure to groan about it and let me know how gross it is! 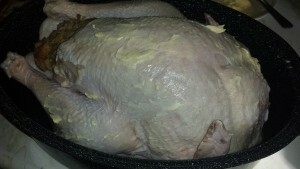 Once it’s all been rinsed out, put your turkey in the pan! I have finally broken down and purchased a metal pan, for many years I just bought the disposable ones and covered it with tinfoil. Next go ahead and put all that bread you mixed up into the body cavity of the turkey, we also stuff the neck area since there is usually a pretty big space there to put stuffing if I run out of space in the middle. Some people sew their turkeys up after adding the stuffing, but I don’t, I just leave mine like it is. This next step is important if you want crispy skin, butter your turkey. Yup, just rub some butter allllll over it. I have friends that use bacon strips of the top of their turkeys and that too sounds really yummy, but I haven’t tried it out yet! After all that, go ahead and slap the lid on it! Make sure the lid covers the whole thing, and sits nicely or you’ll end up with a dried up, burnt bird! Set your oven for 325 and make sure your racks are at the lowest position so your turkey will fit! Here is a link to cooking times for turkeys depending on size, as well as what the internal temperatures should be for the turkey as well at the stuffing so no one gets sick from their holiday turkey! One of the most used things I ever bought was a meat thermometer! I use it all the time. I’m sorry I don’t have a photo of the finished turkey for you! After all the work and waiting, we just ate it and I totally forgot to take a picture!